I used a loose watercolour style, colouring each leaf with two layers of distress ink to provide lots of variation in colour. Absolutely beautiful... Jaw dropping beautiful! Ooh, love that sloshy colour! I love all the gold...it is fantastic with the bursts of fall colors. 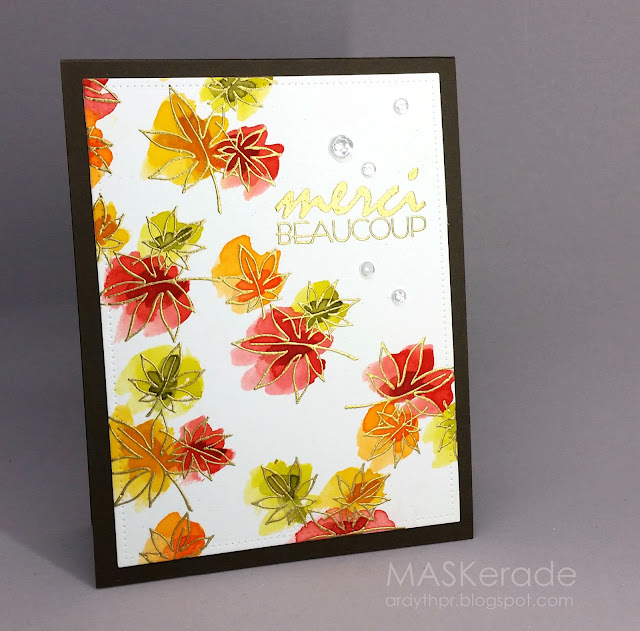 Your embossing and loose water coloring are spectacular! Beautiful in all its boldness! Great colors with that warm metal embossing! Wow! This is really stunning work. Love what you've done here ... beautiful ! Wonderful Ardyth - love the colours and the composition. I love the loose watercolor look, Ardyth. When I try it - not so much. Ditto to Bobby's comment. One day I will conquer this technique! This is one gorgeous card! !